Chiefs Tight End Travis Kelce Gets His Own Dating Show on E! The E! 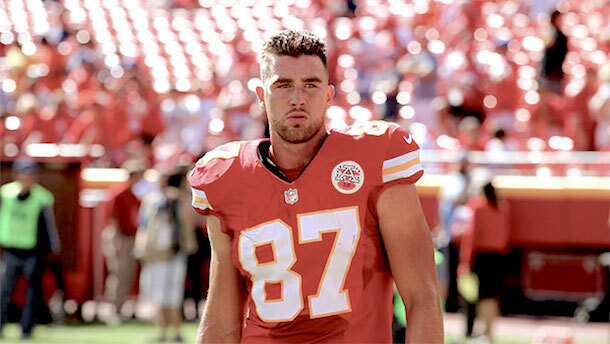 network has given the green light to a new dating show starring Kansas City Chiefs tight end Travis Kelce. It’s called—are you ready for this?—Catching Kelce. “On top of being a well-respected athlete, Travis has a fun-loving, over the top personality that draws people to him, and we are excited to give our viewers an up-close look at his search for love,” reads the official phoney Hollywood statement from Jeff Olde, vice president of programming and development at E! How will the show work? Basically just like The Bachelor, with three minor tweaks. First, the bachelor is Travis Kelce. Second, instead of 28 eligible bachelorettes there will be a whopping 50, one from each of the country’s states. And third, the ladies themselves will decide who goes on group dates. And according to Deadline, that means “lines will be drawn and friendships will be tested as the women pick and choose who gets the extra time with this football superstar”—or in other words, cat fights! Kelce was sixth among tight ends in receiving yards this season. However, E! didn’t hand pick Kelce to be on the show because he’s good at football. They picked him because he’s a good-looking white guy with sweet dance moves who will appeal to advertisers trying to sell chocolate-coated diet cereal bars to middle class suburban women. Catching Kelce will premiere some time in 2016. I’m sure it will be fantastic.